It would be really nice, after 53 years, if someone who was in charge of designing the next edition of ACQUIRE would actually take the time to play the game of ACQUIRE. Hasbro released the 2016 edition of ACQUIRE in November of 2016. Hasbro had given their rights for the Avalon Hill series of games to their subsidiary Wizards of the Coast in the mid 2000's and this included the game of ACQUIRE. 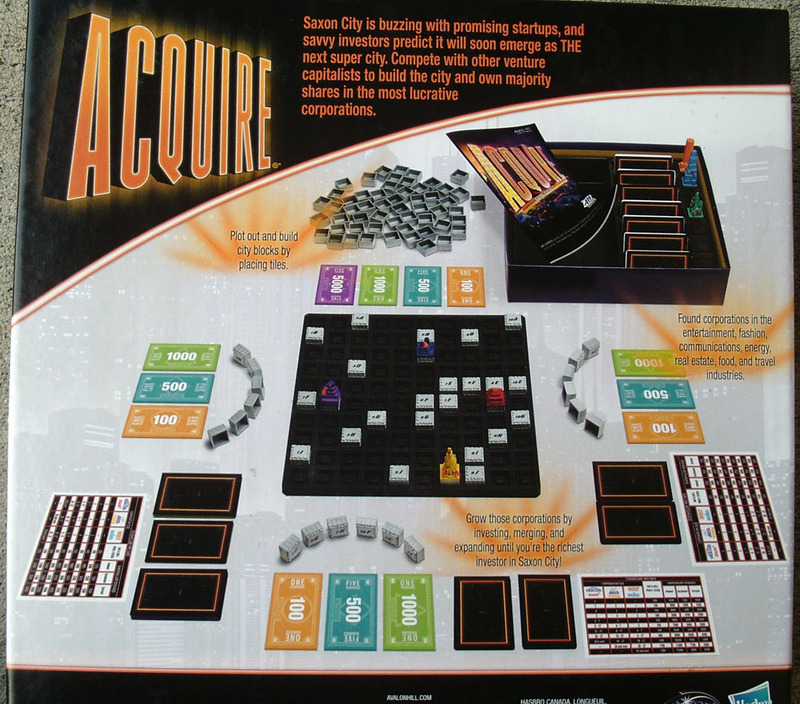 Wizards of the Coast proceeded to produce the most hideous version of ACQUIRE ever delivered in 2008. Now it appears Hasbro has somehow brought the brand back to the Hasbro fold. The front of the box has the Avalon Hill logo and a Hasbro Gaming logo. The back of the box has a copyright of 2015 Wizards of the Coast. There is also a Wizards and a Hasbro logo. The game is not currently found on the Wizards website but it can be found on the Hasbro website. All the changes made in this edition, whether they were cosmetic or involving strategy, were done without much insight or foresight in the game of ACQUIRE. Its as if Hasbro was under some kind of contractual obligation to put out another edition so they just threw something together, stirred it with a swizzle stick, and put it out as cheap as they could while using better materials than the previous edition. Maybe they just allowed some college students, who had no clue about the game, to utilize it as a class project. 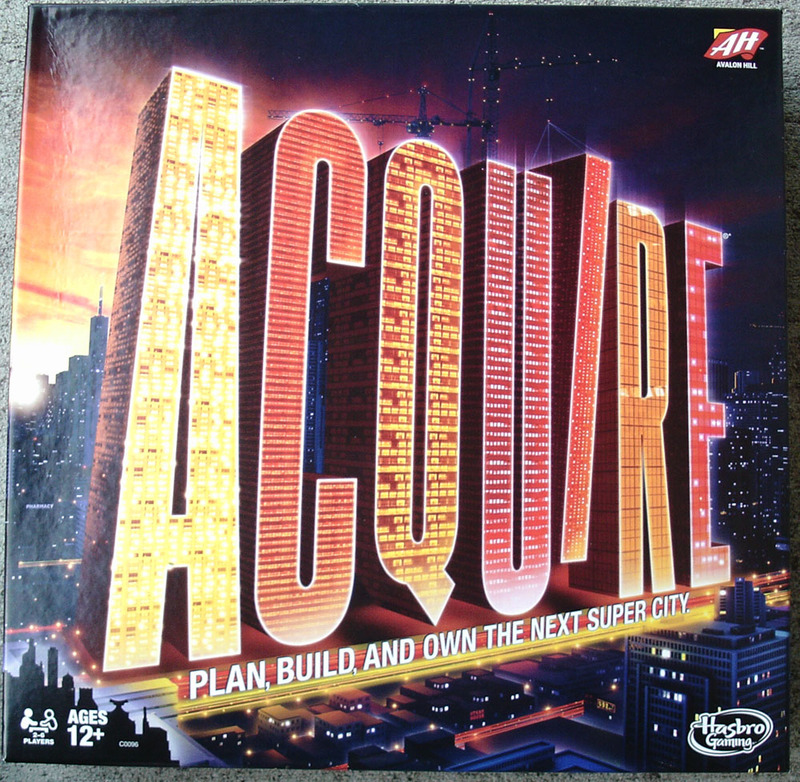 Either way, it would be nice if someday in the future the game of ACQUIRE would receive the intellectual nurturing it deserves from Corporate America. Since Hasbro has referred to this edition as "Building a City," shouldn't that city be called "Sackson City" and not "Saxon City?" In the following paragraphs I will outline the good with the bad. There is a lot more bad than good. I will also include photos that are not professional but, at a minimum, they will give you a closer look at the game. The tiles are a nice size but the choice of font for the printing of the designations on the tiles makes them very cumbersome to use. It appears to be some type of italicized font and they chose to print the numbers smaller than the letters. The human brain can read two things together when they are the same size. When they are made as two different sizes, the human brain tends to have to process them separately. This causes a longer time to process what tile a player is looking at. Once the player has determined what tile they are looking at they now look at the board to see that they can't see where they are supposed to play the tile because the board has illegible square designations. 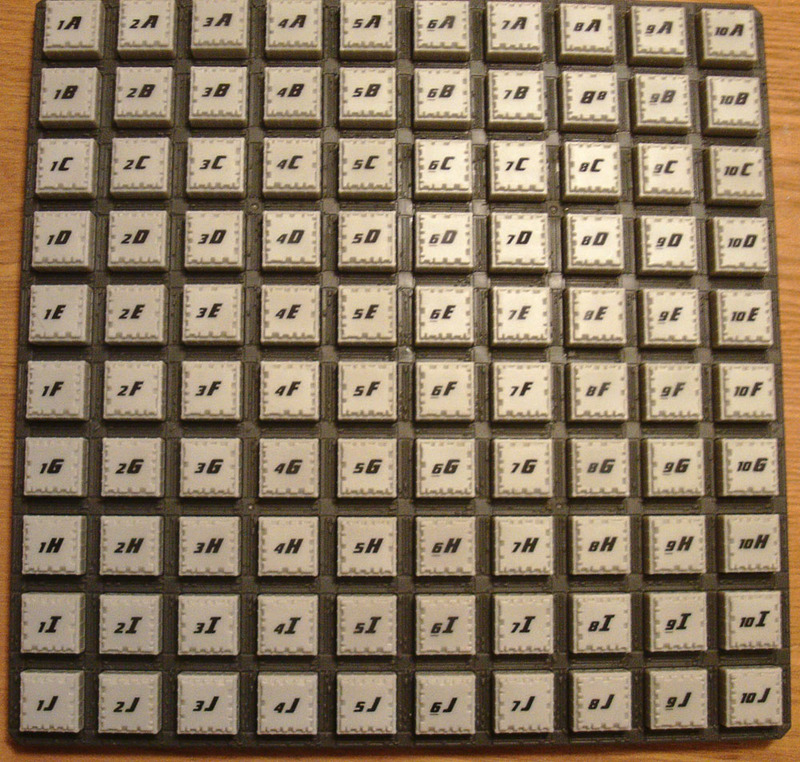 At least Hasbro made the board smaller (100 squares as opposed to 108 - 1-A thru 10-J) so that the 10 x 10 grid allows the seasoned ACQUIRE player the ability to count the squares to figure out where their tile can be played. What a frustrating way to play a game. Games should be fun not frustrating. 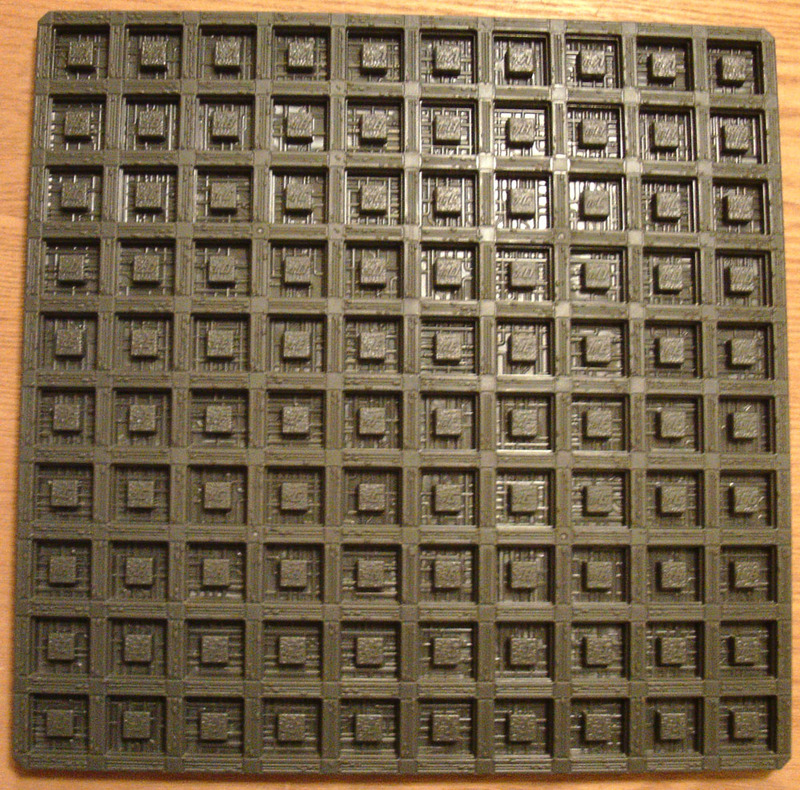 I am at a loss as to why Hasbro felt the need to make the board 10 x 10 instead of the 9 x 12 board that has been standard. 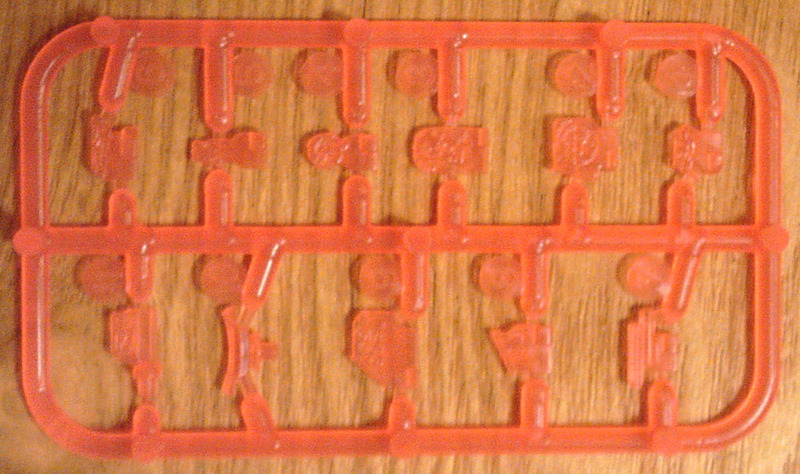 I would assume that the square design of the overall board probably saved them money in mold costs for the board, the board itself, and the box. I certainly can's see any strategic advantage for having this reconfigured board. In the long run it shortens game play and reduces possibilities during game play. Unless you are a true ACQUIRE fanatic who wants this game for your collection, don't waste your money on this edition. It is not an edition that lends itself to everyday game play. The stock certificates are the size of regular playing cards which is an upgrade from the size of stocks that were used in the 1999 edition. However they are much thinner. The artwork design is similar to what Hasbro used in the 1999 edition, unimaginative. The artwork on these cards is actually non existent other than the simple names of the corporations which are also unimaginative. 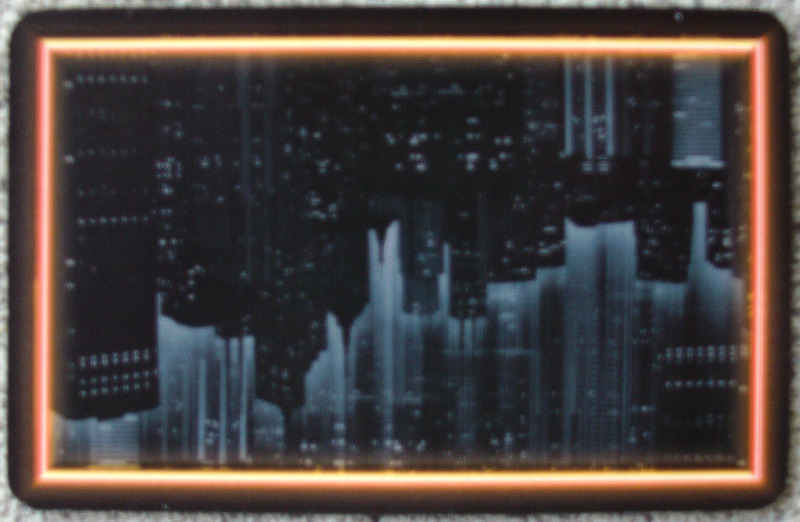 The backs of the cards are printed mostly black with an orange border and a watermark of a city skyline. Hasbro has kept the same hierarchy and starting price of companies that has existed since 1964. There are two higher priced companies (Bolt & Echo $400), three middle priced companies (Fleet, Etch, & Rove $300), and two lower priced companies (Nestor & Spark $200). What is different is that they have reduced the total number of stocks from 175 to 168. 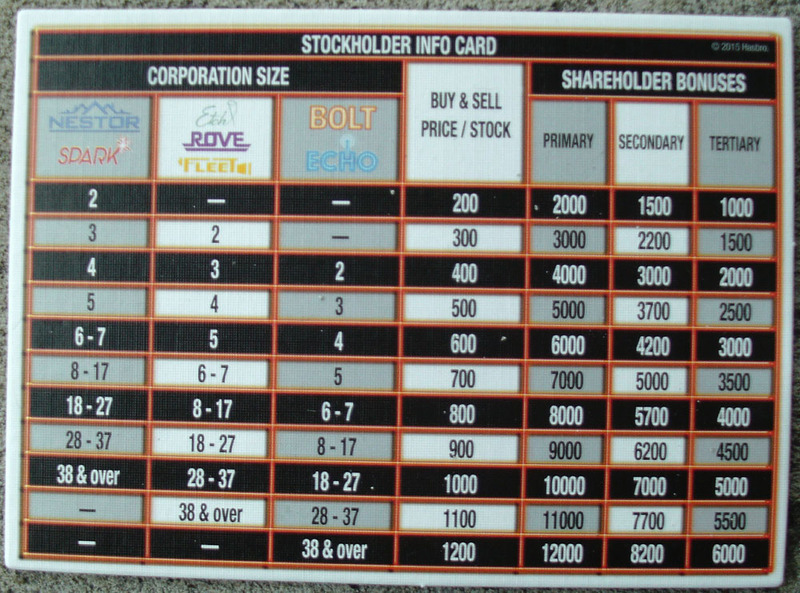 This makes a total of 24 stocks per company instead of the standard 25. My first observation is that a competition for an even amount of stocks is much more likely to end in a tie than a competition for an uneven amount. If the designer was truly thinking of strategy and attempting to help level the playing field of the game, then they may have been thinking that a tie for majority of a company would help to spread the cash flow during game play. Yet it also reduces the total amount of cash flow that can be generated throughout the game by reducing the total number of stocks available. The information cards are one of the better pieces of this edition. They are made on very thick chipboard and resemble mini game boards. It is almost as if they are overkill compared to what Hasbro spent on the rest of the game. They are a nice size and they are bright and easy to read. 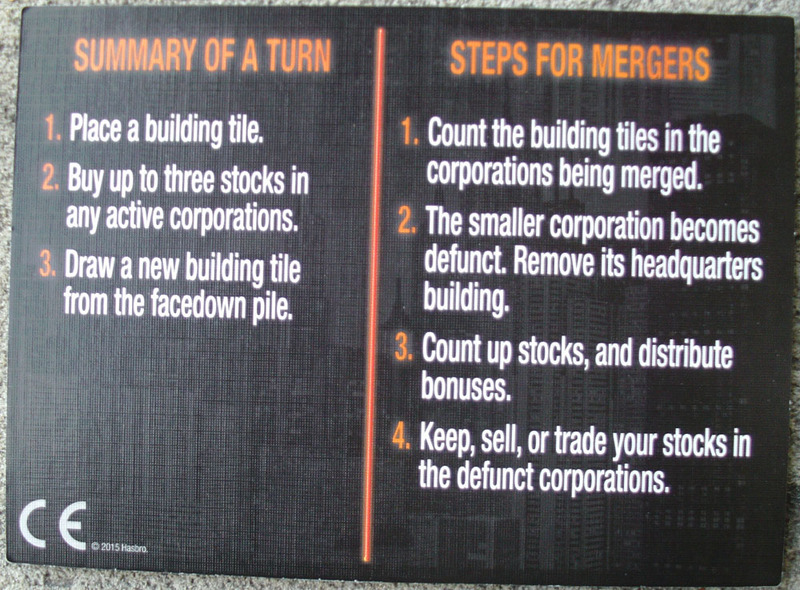 These cards also have a "Summary of a Turn" and "Steps for Mergers" printed on the backs to help newer players. That is where the positive points of the information cards ends and the "swizzle stick" begins. Well, the "swizzle stick" of strategy changes in this edition had actually begun with the reconfigured board and the change of stock amounts but the changes in the level of pricing of companies and the addition of a third majority payment are really a head scratcher. Hasbro has decided that a "safe" company happens at 10 tiles instead of 11 so they figured that the price points needed to be changed. It is how they changed the price points that has me perplexed. I am also assuming that they were trying to spread cash flow to more players by adding a "Tertiary" bonus but they may have actually added to the problem of the sometimes one sided games of ACQUIRE. 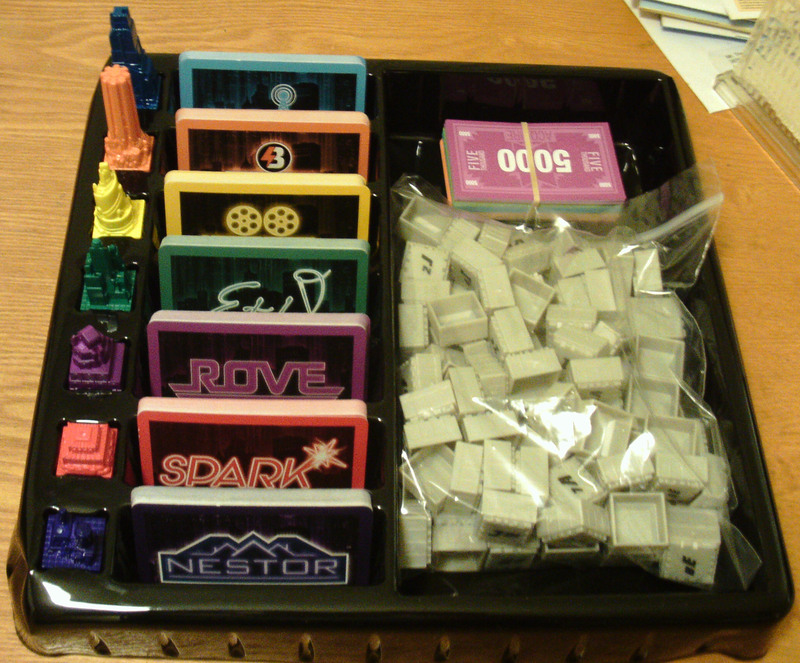 In the traditional game of ACQUIRE, a company is safe when it attains 11 tiles. Hasbro has decided to change that number to 10 in this edition. In the traditional game of ACQUIRE, one particular price point of a companies worth during game play is the range of 6-10 tiles. Then once the company became safe the price range was 11-20 tiles. The pattern continued until the size of the company went to 41 & Over. Since Hasbro has decided to change the "safe number" they really needed to change the price ranges for the companies worth at anytime during game play. It would seem that the logical brain would think to change the range to a number of 6-9 tiles and then the subsequent series as 10-19 and so forth until the 40 & over. That method would be beneficial for the players to be able to retain those price ranges amongst all the other information that must be retained during the game of ACQUIRE. Hasbro decided to reconfigure the range as 6-7 tiles, then 8-17, 18-27, 28-37, & 38 & Over which makes the processing of information and flow of the overall game more cumbersome. This reconfiguration doesn't even allow for a price increase when a company becomes safe. This is one of those areas where I feel like design decisions are being made by people who have never played the game of ACQUIRE. The other issue is the third majority. I get "IT". I have always gotten "IT" since the first time I played the game of ACQUIRE. Too many games of ACQUIRE can go to one or two players quickly. 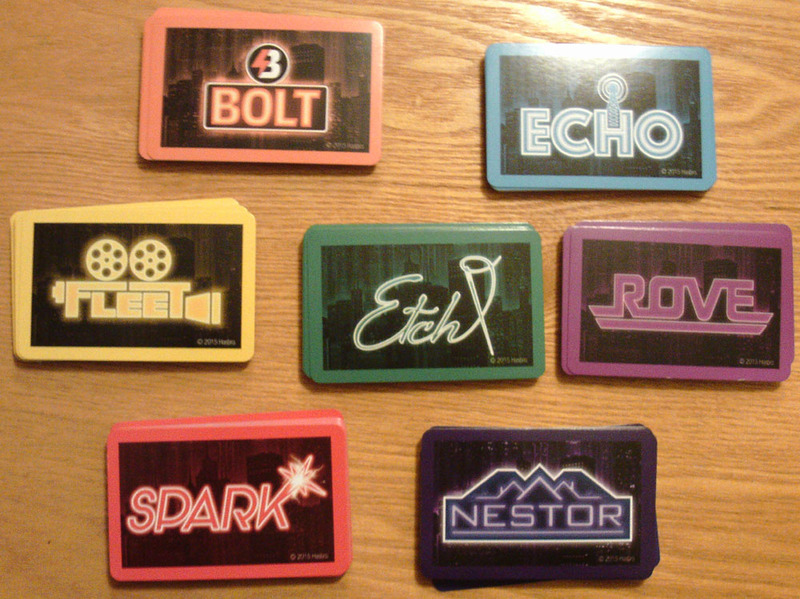 It is the reason that the game of ACQUIRE has not ascended to its rightful place as a game better than Monopoly. I have always understood the need for change but as much as I can see the addition of a third majority helping, I can also see the negative. Let us look at an example. In the traditional game of ACQUIRE, if the hotel chain of Luxor had two tiles and was taken over by a larger company the payout would be $2,000 for First Majority and $1,000 for Second Majority. With Hasbro's re-envisioning, a lower priced company has a payout of $2,000 for First Majority, $1,500 for Second Majority, and $1,000 for Third Majority. My first thought was, "Wow, what if only one player purchased stock in a company before it quickly went out. Now we just gave more money to one player." I will give Hasbro credit, they thought of that. They have set up the rules so that if that situation occurs, it has the same result as the traditional method of ACQUIRE. The rules state that the one player would receive the First and Third Majority only, that makes the total amount of $3,000 which is the same as the traditional game. However, Hasbro neglected to address what is done with the Third Majority bonus when there is no Third Majority stockholder. Do we forget the payout or does it get spit up by the two players with First and Second Majorities? There will be many games when players don't purchase a Third Majority in companies because they are too involved in keeping First or Second Majority in their own companies. Hasbro has left it up to the players to decide how they are going to play this situation. As much as Hasbro thinks that adding the Third Majority is going to "spread the wealth" in the game of ACQUIRE, it actually adds more wealth to those players who get the "early jump." Since the First Majority amounts remained the same in this edition as in earlier editions, it would appear that the players who hold Second Majority will gain more wealth than in previous editions. However, if there is a tie for First and Second Majority, then both players benefit from the extra amount. The compensation to this effect is that there can be a third player that gets the traditional amount of a Second Majority. But what if there is no third player that has invested in that company? Even if the decision is to forget the third bonus when no players hold Third Majority, then the other players are still farther behind the "early jumpers" than in a traditional game of ACQUIRE. If the decision is to split the third bonus between the top majority holders, then the game has increased its long running problem of keeping the games competitive on a regular basis and attracting new players. The Rules Booklet is very nicely done. It is a 14 page, 5-1/2" x 8-1/2", glossy booklet with extensive information and illustrations. It is a large upgrade from the awkward sized paper booklet that Hasbro used in the 1999 edition. Their illustrations are done very well and the colors are very bright. Even though Hasbro doesn't address the lack of a Third Majority Holder, they do address other traditional "gray areas" that have occurred in earlier editions of ACQUIRE. Hasbro gives very good descriptions to the illustrations concerning game play. 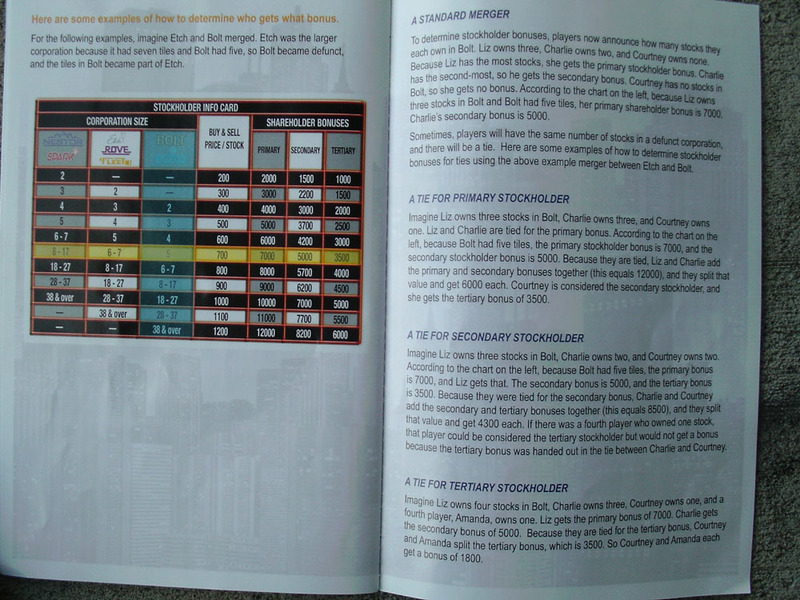 This booklet goes a long way to helping new players learn and understand the game of ACQUIRE. It is just a shame that they didn't give this much attention to the rest of the game. Hasbro has fully illustrated and explained how to play the game of ACQUIRE in this booklet but you still can't see the board or decipher the tiles. Hasbro has brought back the 3D company markers. They are much smaller than the 1999 edition but that is because the tiles are smaller and the markers need to fit on the tiles. 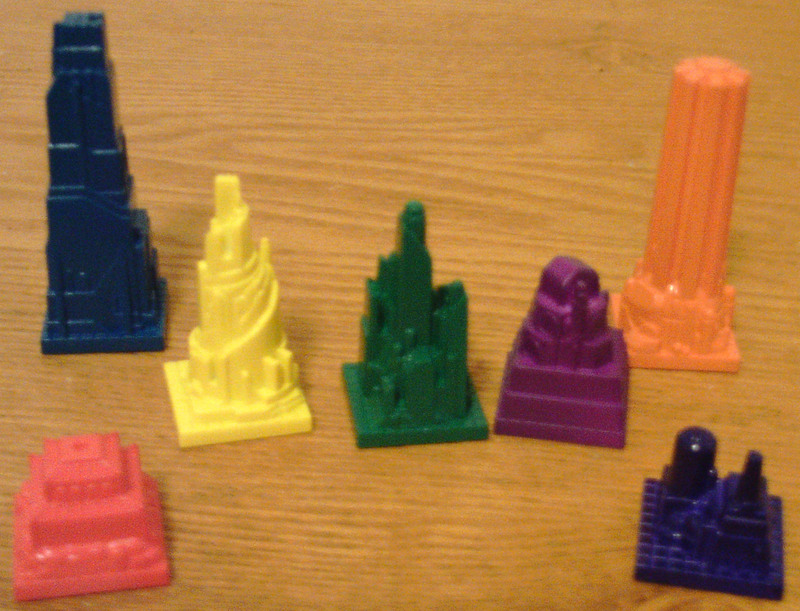 Still, they are the 3D buildings and while not as stylish as the 1999 edition they are a nice component in this edition. The 3D markers are probably one of the most popular features of the 1999 edition so recreating them was a good move by Hasbro. What I don't understand is the "Corporation Banners." Hasbro has a quarter page illustration in the Rules Booklet to show us how to attach them to the Company Markers. Yet they are orange blobs that make no sense. I guess Hasbro figured that since the Corporate Markers were of a smaller stature they should dress them up when actually it just looks awkward. There is no mention of their purpose in the Rule Booklet and only six of the markers get them. I would suggest not even bothering to use them. 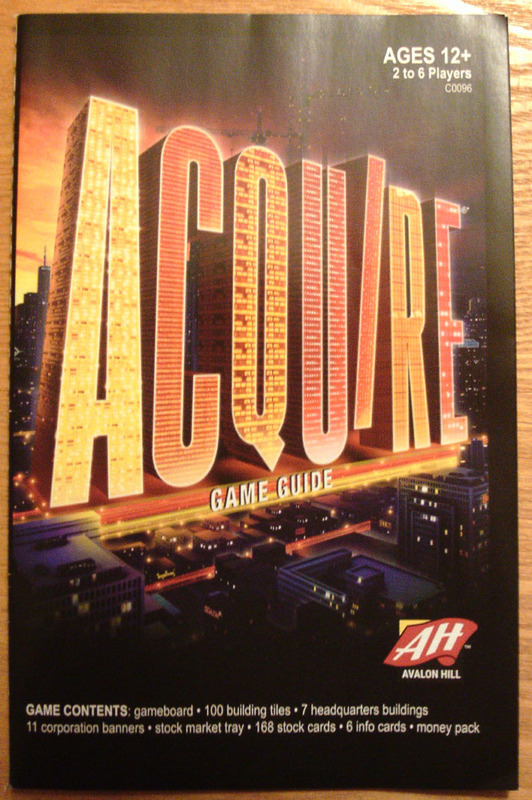 The 3M Corporation had the game of ACQUIRE for 12 years and they never figured it out. They were even the ones who made the original changes to Sid Sackson's ideas and never thought of the change to the money. This mistake just seems to perpetuate through the years. Avalon Hill had the game for 21 years and never figured it out and now after 19 years, Hasbro has actually made it worse. Now we have another edition that has completely missed the need for the correct amount of bills in the game of ACQUIRE. 53 years of ACQUIRE games and Corporate America is still producing an amount of bills for the game that were good for the test market games in 1963 but have been wrong for all the other games since the game was put into mass production in 1964. In the first test market games of ACQUIRE, players could only purchase one stock certificate per turn. Therefore there was a large need for the $100 bills. So, 3M decided to put sixty (60) $100 bills into the game. They added forty (40) $500 bills, thirty six (36) $1,000 bills, and thirty (30) $5,000 bills. The decision was made fairly quickly at 3M in 1964 to readjust the game of ACQUIRE from its original format to save on production costs. 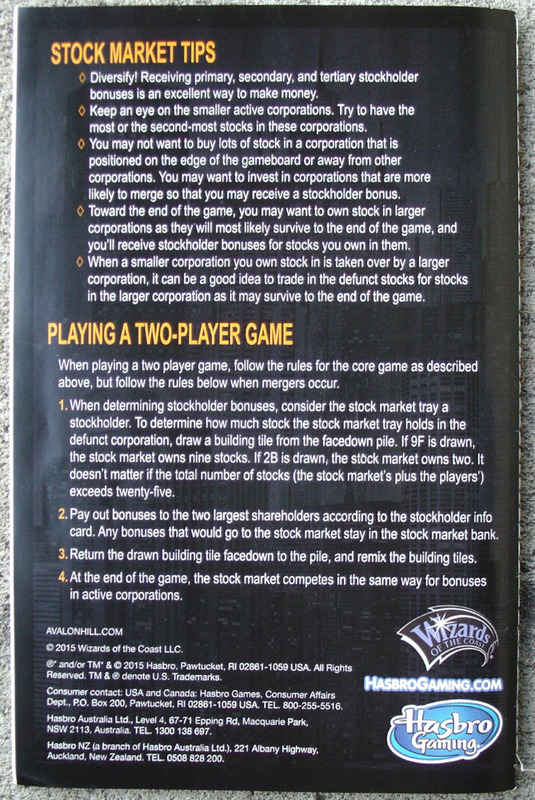 Players were now allowed to purchase three (3) stock certificates per turn. Yet 3M neglected to visualize how this would affect the money. Now the game of ACQUIRE needs more $1,000 and $5,000 bills, especially $1000 bills and it needs far less $100 bills. Since 1964 the $100 bills have had a very minimal need in the game of ACQUIRE but yet they still keep producing the game with sixty (60) $100 bills when the game only needs thirty (30) maximum. The $1000 bills ranged in number from thirty to thirty six (30-36) depending on the edition. This situation causes the bank to run out of $1000 bills during game play as the game begins to generate large payouts and players are forced to continually turn in their $1000 bills for $5000 bills. This in turn quickly depletes the availability of $5000 bills. All the while, the stack of $100 bills is virtually untouched. To combat this situation Hasbro has included in the 2016 edition of ACQUIRE sixty (60) $100 bills, forty (40) $500 bills, thirty (30) $1000 bills, and twenty five (25) $5,000 bills. So, they actually lowered the amount of the $1,000 and $5,000 bills while at the same time adding an extra and higher amount of payouts during mergers and at game end. Players of this edition will be constantly counting $100 bills because there won't be any other bills left to use. Also, as you can see by the picture, the money is very dull and unimaginative in its presentation. Hasbro spent all of about 5 minutes coming up with this artwork. This is another area where it is evident that nobody who worked on the game actually played the game. When I first saw this edition I was excited. I ordered four copies. Then I opened the box, grabbed the board, turned it over and realized that neither side had any visible markings. I was instantly bummed. I had expected so much more after noticing they had done the edition in plastic. I always keep hoping that the game of ACQUIRE will receive its due. Yet it is kind of like Charlie Brown continually trying to kick the football, I keep wasting my money on these new editions that I don't even want to play. At the cost of the 1999 edition on the secondary market (Over $150 shrinkwrapped) Hasbro would have been better served to just reissue that edition with upgraded money and stock certificates. At least they wouldn't continue to "rip-off" the unsuspecting public. I hope I have provided enough information so that you can make an informed decision on whether you too want to waste your money on the 2016 Hasbro game of ACQUIRE.